If your French is a little rusty, you'll be pleased to know that I have a translation for the title of Nuxe's bestselling product, Huile Prodigieuse. It means 'extraordinary oil' - and I've been thoroughly testing it just to see how extraordinary it really is. I love my oils, possibly a little less than I love creams (and definitely less than I love balms), but I still love them. I feel like you can control creams a little more, whereas I always overestimate the amount of oil I use in one go, leaving me slathered, rather than nourished. Nuxe's Shimmering Dry Oil, however, is one of a few exceptions to that rule. 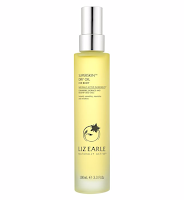 With its spray nozzle, rather than a pump, this product limits your usage to a small spritz instead of a goopey mass of oil, allowing a smooth, non-greasy finish for your skin. I say 'non-greasy', because this is definitely a dry oil - as it says on the packaging. It feels dry when you rub it into your skin, which is a odd sensation (a neither pleasant nor unpleasant one). And after application, it feels as if nothing is on your skin. It's that light. For those of you who love a that shimmering holiday tan, this is an ideal product for you. It screams 'hot summers on a Greek island' (minus the sunstroke, tequila hangovers and falling into the pool wearing wedges that only see the light of day once a year). 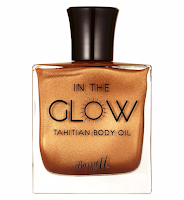 The Shimmering Dry Oil not only provides you with a very light bronzing effect, it also features a shimmer - and, no, it's not glittery - which only slightly indulges your fantasy of becoming a Victoria's Secret Angel. On Nuxe's website they suggest mixing this in with your foundation or dabbing a little onto your cheeks and the bridge of your nose for a highlighting effect. They also encourage using it as a hair oil. However, I would stick to using this on your body. I tried mixing a spritz with my foundation and it just ruined the consistency, making it ultra fluid - and using it as a highlighter just made me look as if I had a dirty face. This could be because my skin's so light, so if you have darker skin and you've found that this works great as a highlight, please leave a comment so that others can find out! Using it on my hair wasn't such a good idea either. My hair has very damaged ends, very oily roots and an extremely dry scalp (basically it's a mass of problems), and this oil didn't seem to do much to help. The Shimmering Dry Oil did seem greasy when used on the ends of my hair, which is strange because it works so well on my skin. I think I'll stick to L'Oréal Professional's Mythic Oil before I can find something better. When it comes to the scent, this product puts me off. It's VERY floral, a lot like Grandma's perfume - or L'Huile de Leonor Greyl, if you've ever tried it. However, I would think the scent comes from the 95.5% natural ingredients used in the formula, including seven oils which comprise: tsubaki oil, almond oil, camellia oil, borage oil, hazelnut oil macadamia oil and argan oil. Great for your skin, not for your nose. But hey, some people might like it. 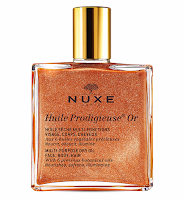 Nuxe's Shimmering Dry Oil Huile Prodigieuse retails at Boots at £29 for 100ml, or £20 for 50ml.